Do you love beaded jewelry? The Can-Can Cabochon Necklace tutorial will have everyone "oooo-ing" and "ahhhh-ing" over your knock-em-dead piece of jewelry. With step-by-step instructions, you'll be able to make your very own Can-Can Cabochon Necklace, for yourself or to give as a gift. 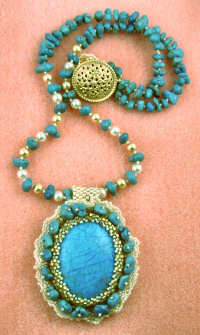 This beaded jewelry tutorial combines bead embroidery, peyote stitching and bead stringing. But you'll also learn the Russian Spiral and a pearl embellished ladder stitch.